1. You weren’t completely happy with your life so you changed it. What did it take to make that decision, it can’t be easy when so many others don’t make the change? It was a really easy change for me to make, I was totally fed up with being unhealthy, it had gotten to the point where I was smoking 20 a day as a minimum. I was outside work one day and a man ran past me in the street, I looked at him and decided then and there that I would try and be like him, he looked so full of life running in the street, I on the other hand….. I dropped the cigarettes that day and started running and cycling, in many ways I am lucky, so many people try to make lasting changes in their life but fail, I was lucky because the option I took, to run, was something I found a natural love for, still to this day, four years on I love running. 2. 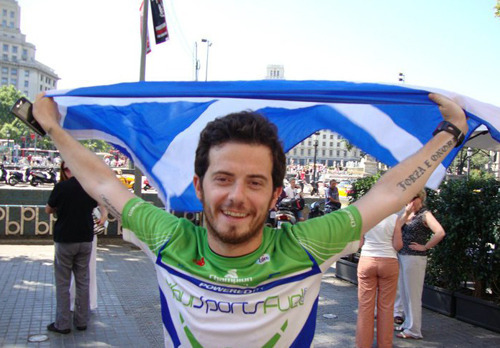 You started on a feat that is fairly achievable; cycling John O Groats to Lands End and then built it up. How important is it to start on a smaller scale first? It may seem like a small feat these days but at the time it was a massive achievement, it still is to me. My proudest moment with regards to fitness is still my first ever 10k race in 2008 after stopping smoking, people get to focussed on the size of the goal and the drama of a challenge, one achievement might not be a big thing for someone but a huge deal for another. I say set lofty goals right from the start, make them achievable but really tough to achieve. 3. You are still working as a lawyer?! How do you find time to balance it all? (I’m not a lawyer but work in a law firm) To be honest with you, I work full time in a law firm but because I love what I do outside work it never feels like hard work If that makes sense? How can giving presentations to schools and running races be deemed work when it is what you love. The hard part is to make that you’re living, you do need some structure though, a place to go that keeps your feet on the ground and my colleagues are very supportive of the things that I do. – How did they take it when you took 56 days off to run across Europe? They were very cool about it, I had three months off to do it, unpaid leave. I did wonder how I would pay my bills and fund the trip but I had a chat with them and it basically transpired that they couldn’t pay me a “wage” because I wasn’t here but they could be a corporate sponsor and fund some of the trip so that’s the way it panned out. Like I say they were very good about the whole thing and I think that my work has improved because of this freedom. – How do you even start an expedition of this scale? When I started out I had no idea what to do and indeed how much was involved, it was pretty daunting. It’s kind of like trying to get it clear in your mind that you are about to run a 100 mile race somewhere, you have to break it down otherwise it’s impossible. At the same time you have to just get on with it, that’s what I did, I looked at it in separate projects, what do I need, I need kit for the run, who do I need to speak to in order to get that kit donated, that kind of thing. 4. What does it feel like to step out from a crowd and be recognised by people? I won’t lie, it does feel nice sometimes to be given awards and so on but the best thing about this is being asked to help other people and being asked by charities to give them advice on fundraising and that sort of thing. It has opened a lot of doors for me but mostly to the benefit of other people so I sleep well at night knowing or at least I think that I am making some sort of difference in my own small way. 5. You are relatively new to the adventure world, what can we expect from you in the future? I don’t really know, there are so many people doing so many incredible things I often wonder if there is anything left to do! I don’t really do things to be the first or the fastest I do them because I want to, I ran from Amsterdam to Barcelona because Barcelona was the last place me and my Family went on holiday before my Mum passed away. If you do things for the right reasons then it’s easier to get through them. I have another ultra running season in 2012 and then I am planning a big challenge possible in India but that’s about all I can say for now. 6. Which is your strong suit; racing or endurance? Why? I am not the fastest, I used to be sub 18 minutes for a 5k which is decent but since moving into longer distances I do not have enough time to focus on speed, I am still just over 18 minutes for the 5k but I can only see that getting slower in 2012. I definitely want to get sub 3hr for the marathon, that was a goal for 2012 but might have to wait until next year. Endurance is what I love, being out there stretched, thinking you can’t go on but then finding that you can. There has been one occasion where I quit a race but I will be returning this year to finish it. I always think it is important to finish what you start no matter how long it takes. 7. How do you pick your next “To do”? Now what I do is Google “map of the world” and I look at it and think about where I would like to go and list my reasons for it. I then work out the distance and then figure out from doing some research what mileage I think would be possible to run each day, I don’t think I would ever opt for more than 50 miles per day at a push. There is only so much I am willing to put my body through, I want a very long and mobile life. 8. How important is it to push to the outside world that you are Scottish? Or are you willing to pull an Andy Murray and be labelled a UK/English athlete? I am proud to be Scottish but also happy to be British, it is not something that I really think about to be honest. 9. Who does your support team consist of? My Girlfriend Ferelith is always there for me, she is so supportive of the things that I do and I am forever planning new adventures, I can imagine there aren’t many people who would put up with that, I am very lucky. Other than that I just get on with it myself, I had some help on the European run but that was a onetime thing, I look at it as my decision to do this stuff so I shouldn’t burden anyone else with it. 10. How did you get into the speaking gig? It was when I came back from the AtoB run, my local rotary club and old school asked me to give a presentation on my adventure, I was very nervous but once I got up there I loved it, it’s a real opportunity to share the world with people and I think it is a good educational tool for young people. 11. What is your favourite part of running? It’s got to be the places it takes me and the people I meet from doing it. At least once a week I head out from my front door and pick a direction or I drive away to a place I’ve never been and just run, there is nothing more exciting that not knowing where you are going or seeing somewhere new, especially when it is close to home. I have live in Edinburgh all my life and there are still places I discover on a run that I’ve never been to, streets and parks I didn’t know existed. 12. What does your weekly training schedule consist of? When I trained for the 50 marathons run I was strict, three weeks of heavy training, minimum of 80 miles each week and then one week of around about 50 easy miles. Since then I have a much more relaxed approach to training, I don’t lose sleep if I miss a session and I just listen to my body and mind and go for however long I feel like it. There are obviously set long runs, usually on Sundays that I have to do but apart from that I just fit in the odd run when I can. It’s important not to take the fun out of it. 13. Are most of your friends now fellow adventurers or are they still the ones from home? I am still close to all my friends from before, I have also met a whole new set of friends, I am not one dimensional since taking up adventure and running, I still like to get to the pub and have a proper drink sometimes, just not as often as I used to. I play in my band with old xchool mate and when we play gigs it’s a chance for us all to get together and have a session, I like that. 14. 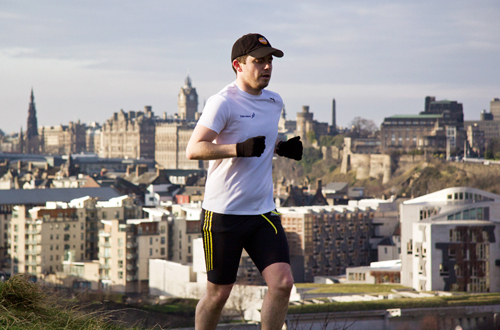 What do you think you would be doing now if you had never quit smoking and taken up running? 15. What charities do you run for and why do run for charities? I run for the Parkinson’s charity Wobbly Williams – www.wobblywilliams.com I ran the 50 marathons in memory of my Mother and for the charity that helped my family at that time, I raised over £33,000 for them but it was a one off thing for me. I decided to run for Wobbly Williams because I met the founder of the charity Bryn Williams at an awards ceremony, we both won the inspiration award that night and after speaking to him for a few minutes I was floored by his passion and belief in the charity he had set up. Bryn has Parkinson’s you see and when he was diagnosed he researched online and could only find negative press about the disease, he decided to give people hope so he set up the charity. We have raised over £400,000 in just over three years, the target for us now is millions, its going directly to treatment and finding a cure. Bryn has some great resources on the website that people should check out. 16. What is your technique for tricking your body into thinking it has more to give? 17. Why do you want to help others achieve their goals? I don’t think I truly can help people do that, they have to want it bad for themselves, the best I can hope to achieve is to give them ideas and plant little seeds of adventure, I’m not saying that you have to go and run for 24hrs, I totally get why that would not be for everyone. It is merely a matter of continuing to learn and experience new things and that’s exactly what I try to get over in my presentations. I think that’s spot on and I will continue to push my own boundaries and make the most of this one, short life in the best way I can. My Dad helped me, he was a rock when my Mum passed away, I don’t tell him enough but I hope that by me doing what I am doing is proof enough to him that he raised me well and that I am forever grateful for that.